The possibility of removing dangerous charged particles from the vicinity of Earth was mentioned in Chapter 1 (see Electrostatic Tethers). As stated, the energetic particles in Earth's Van Allen belts steadily degrade spacecraft electronics, sensitive optical equipment, solar arrays, and human body cells because they break the chemical bonds within the materials they consist of. They also cause localized charge effects that can disrupt and even damage electronic equipment. The high radiation fluxes in the Van Allen belts thus limit long-duration crewed missions to orbits below altitudes of about 1200 km (750 miles). Moreover, spacecraft and people passing through the belts on their way to the Moon or other planets have to minimize their transit time to limit the damage. This is particularly problematic for spacecraft utilizing solar electric propulsion, because the efficient but low thrust means that they take a long time to spiral through the belts up to higher and safer orbits. Especially the solar cells on which the electric propulsion depends degrade fast, meaning satellites have to start out their journey with considerably overdimensioned solar arrays. Consequently, the radiation belts form one of the primary obstacles that prevent solar electric propulsion from being used in propulsion stages for moving satellites from low Earth orbit to geosynchronous orbit (GEO). Less trapped energetic particles in the Van Allen radiation belts surrounding Earth thus means increased safety for crewed missions and a higher reliability and lifetime for spacecraft in Earth orbit, as well as increased potential for solar electric propulsion. TUI is studying a tether concept for cleaning up the Van Allen belts; it is called Electrostatic Radiation Belt Remediation (earlier it was called the High-Voltage Orbiting Long Tether [HiVOLT] System). It utilizes lightweight conducting tethers, each many tens of kilometers in length, that are deployed into orbits that bring them into the radiation belts. The tethers automatically assume a vertical orientation due to the gravity-gradient forces, and thus align themselves perpendicular to Earth's magnetic field lines (imaginary lines along which the magnetic field strength is the same, and which run from pole to pole). Trapped radiation particles spiral along geomagnetic field lines, so with the tethers being perpendicular to these field lines they are able to encounter as many particles as possible. When the tethers are charged to a large negative voltage, an intense electromagnetic field is created around them. This field will disrupt the spiraling path of the charged particles that come near, deflecting them into other orbits. The deflection process is random, so many particles will have their paths changed but nevertheless continue to be imprisoned inside the cage formed by Earth's magnetic field lines. However, some of the particles will be sent on new courses that bring them out of the radiation belts and into Earth's atmosphere. Over time, the tethers can remove sufficient numbers ofparticles so that the radiation levels inside the belts are significantly decreased (Fig. 5.15). Tethers Unlimited did investigate the potential effects of the increased rain of charged particles into the atmosphere, and concluded that these will be very mild and short-lived, comparable to the impact of a very weak solar storm (an event during which the Sun expels an increased amount of charged particles). To enhance the effectiveness of the electrostatic tether, a series of parallel wires can be used; the wires will automatically stay at a distance and parallel to each other due to the electromagnetic repulsion force between them, an effect similar to how two magnets can push each other away (the force in the wires is a result of the current running through them in the same direction, each creating an electromagnetic field around the wire as well as a Lorentz force reacting on the electromagnetic fields of the other wires). Figure 5.15: A charged particle trapped in the inner radiation belt deflected by a charged electrostatic tether. couple of percent of its natural levels within a year. For that, the system requires 24 tethers, each with a length of about 100 km (60 miles) and a 5-kilowatt power supply, to be put into orbit. 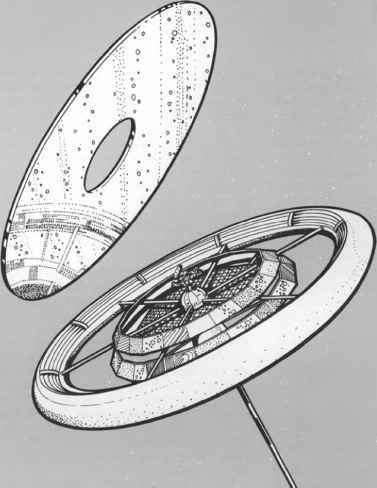 The individual tethers could be built up from several relatively short tether modules, connected to each other like train wagons. Each module would consist of first a short length of conducting tether acting as an electron-collecting anode, a small satellite bus with a solar power collection system and a tether deployment mechanism, a long multi-wire conducting part serving as the actual electrostatic structure, and finally a segment of nonconducting cable to insulate each module from the next. The wires could be very thin, resulting in a total mass of only a couple hundred kilograms for a 100-km-long (60-mile-long) tether system. 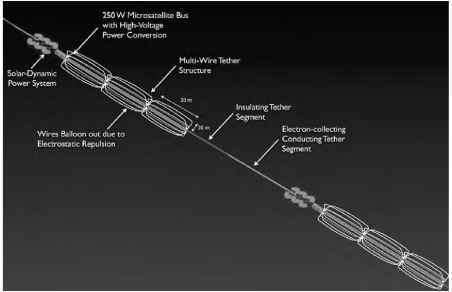 The idea could be proven by a small tether satellite equipped with a several kilometer long tether and sensors able to measure the increased precipitation of energetic electrons into the upper atmosphere (Fig. 5.16). An even more ambitious plan involves the partial remediation of Jupiter's vast and powerful radiation belts. With 100 tether spacecraft, TUI says it should be possible to dramatically lower the radiation levels in a narrow band around one of the moons. That would help make robotic and possibly even human exploration of Europa possible.